Two national conservation groups recommended yesterday that commercial fishing be halted in the Northwestern Hawaiian Islands. 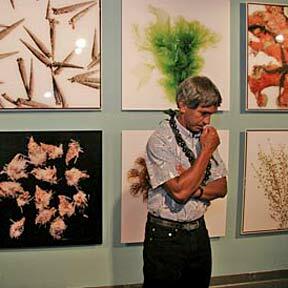 With portraits of the region's sea life, plants and animals in the background, canoe voyaging pioneer Nainoa Thompson waited for an interview at the Bishop Museum. Officials from the PGA Tour and Sony Corp. were to announce a new contract today to keep the tournament here through 2010, sources told the Star-Bulletin. An isle film trove that includes Duke, Bing and Elvis goes up for all-or-nothing auction. Brennan keeps progressing in Jones' system, and the many hard hits he took in JC helped. A judge rules against creating an airline-funded committee to represent the group of retired pilots.